Do you want to know how to spend your Avios wisely? Starting today, we are running updated versions of our ‘Avios Redemption University’ series. This series of articles, which I group together as ‘Avios Redemption University’, cover some of the different ways of using your Avios. In particular, they highlight deals which offer surprisingly good value for your points, such as redeeming on ‘low tax’ airlines. In this introductory post, I want to run through the key principles of how to redeem your Avios points for flights. Fundamentally, it is as simple as going to the ‘spend your Avios’ page on ba.com and putting in the dates you want to fly. In reality there is a lot more to it. You can use the ‘Combine Your Avios’ function on ba.com to move all of your Avios from BA, avios.com (for Aer Lingus, Vueling or Flybe) and Iberia into one account – transfers are free and instantaneous. One of the quirks of the Avios scheme is that you may be better off booking via a different portal instead. Sometimes avios.com or iberia.com will offer you a better deal. I will explain why below. There are many other nuances you need to understand. Much of it will come from experience, but here are some of the key points. The other articles in this series will go into these topics in more detail. Following the last revamp of the British Airways website, you can no longer see a simple chart of how much an Avios redemption flight costs. You are expected to plug your route into this ba.com calculator. There are exceptions to these zones, with some routes such as Cape Town being put into a cheaper zone than their distance would suggest. How do I know what my flight will cost in Avios? If you want to find out the distance between two airports, the best route is Great Circle Mapper (gcmap.com). Type in the airport codes, eg LHR-JFK, and click ‘Distance’. You don’t need to do this, however. There is a calculator on ba.com which will tell you miles required for any direct redemption flight. Alternatively, and more quickly, you can find the Avios price for any British Airways route by using the chart in this article. What are the peak and off-peak Avios dates? Redemption costs on British Airways, Iberia and Aer Lingus vary depending on whether you fly on a peak or off-peak day. The list of British Airways and Iberia peak and off-peak dates for 2019 can be found in this article. The Aer Lingus Avios peak and off-peak dates can be found in this article. The full chart for 2020 should appear around June 2019. BA, Iberia and Aer Lingus do NOT have the same peak and off-peak dates. You can save a lot of points if you apply these calendars smartly. Compared with British Airways, Aer Lingus doesn’t have an October and February peak season during the UK half terms. The April peak season is one week shorter and there’s also no peak season towards the end of May / early June. Redeeming via Dublin on Aer Lingus could save you a lot of Avios during these periods. Flights with any airline other than British Airways, Aer Lingus and Iberia will ALWAYS price at the peak rate. There is a second British Airways Avios redemption pricing chart for trips which use two or more oneworld carriers apart from British Airways. This chart is rarely used but you can find it here. A flight such as London – Doha (Qatar) – Hong Kong (Cathay Pacific) would price off this chart. I discuss some uses of the Avios multi-partner reward chart in this article. There is real value in it if you are heading to Australasia for example. 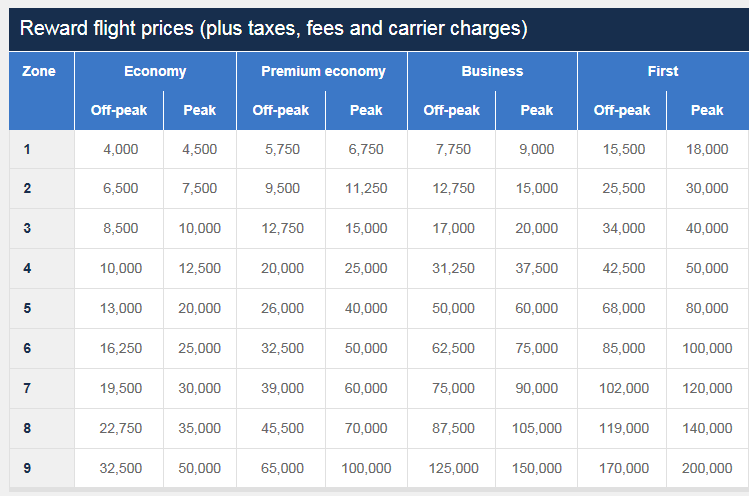 How is Avios pricing calculated for connecting flights? London to Muscat on Qatar Airways (or a mix of BA and Qatar Airways) involves a change in Doha. London to Doha is 3,200 miles and Doha to Muscat is 437 miles. This means your flight will cost (13,000 or 20,000 + 4,500=) 17,500 / 24,500 Avios, one way depending on whether the BA flight is on a peak day. The only exception is when booking a UK domestic connection to/from London to connect to a long-haul flight. No additional Avios are required for this. If you don’t have enough Avios for your flight, British Airways runs a scheme called ‘Avios and Money’ which allows you to use fewer Avios to book your flight in return for paying a cash fee. This is explained in more detail here (an updated version of that article will run next week). In some cases, it makes sense to use ‘Avios and Money’ even if you have enough Avios because the cash option is so cheap. I explained why in this article. What taxes and charges are due? The cost of your reward flight will also include a charge for ‘taxes and scharges’. This is mainly a BA ‘fuel surcharge’ and the UK Government’s Air Passenger Duty. The charge vary amongst airlines. Further articles in this series will focus on low tax options with Aer Lingus and Iberia. However, going back to my example above, London to Abu Dhabi on British Airways, return, has a taxes and charges total of £278 in Economy. This is, frankly, crazy. You can usually pick up an economy flight to Abu Dhabi or Dubai for around £350 return on BA or one of the Middle Eastern airlines. Unless you fly on Aer Lingus or Iberia, starting your trip outside the UK, these taxes clearly make Economy redemptions in long haul poor value for money unless you are travelling at peak times such as school holidays. This is why Head for Points usually recommends redeeming in Business or First Class on British Airways – the taxes will be around £550 per person return (£650 for US flights) but this is still a fraction of the usual cash price of your seat. Taxes and surcharges on European flights are capped at £35 for Economy and £50 for Business on British Airways flights. This makes short-haul redemptions good value in either class. The next article in this series looks at Reward Flight Saver in more detail. You can also use Avios points to upgrade a flight by one class on BA, Iberia and American Airlines. This is explained in a separate article later in this series (the 2018 version is here). For example, upgrading a return World Traveller Plus ticket to New York will cost 48,000 Avios off peak and 40,000 Avios on a peak day. How did I calculate this? A Zone 5 Club World redemption is 50,000 Avios one-way off-peak. A Zone 5 World Traveller Plus redemption is 26,000 Avios one-way off-peak. The cost of the upgrade is therefore (50,000 – 26,000 x 2 for a return =) 48,000 Avios. You will still earn Avios and tier points for the original cash ticket you booked which reduces the net cost of the upgrade. Which airlines can I redeem on? A full list of the 30 (!) airlines which let you redeem Avios points can be found here. This list has shrunk over the last year as airberlin and NIKI went into receivership and Monarch (also now in receivership), Aurigny and Air Malta were dropped as avios.com partners. Flybe is leaving on 30th April 2019. British Airways Executive Club lets you redeem for all 14 airlines in the oneworld alliance plus Aer Lingus, Flybe, Comair (South Africa) and Alaska. Aer Lingus redemptions CANNOT be booked online at ba.com and there is no 100% certain way of checking availability before you call. Anecdotal evidence says that there is less availability than you can book online – with far higher taxes – via the avios.com website. A later article in this series will discuss Aer Lingus in more detail. If you have British Airways Gold status, you will find more economy availability on British Airways flights on ba.com than avios.com. This is because BA opens up additional economy reward seats to its Gold members. A BA Gold member can also get an Avios seat on ANY BA flight if they are willing to pay double Avios. These are called Gold Priority Rewards and I explain how to book them here. You may at times want to book on avios.com. Whilst they do NOT offer oneworld alliance partners except for Iberia and American Airlines, they do offer seats for online booking on Aer Lingus. However, taxes are higher and availability worse on Aer Lingus when booking online via avios.com instead of over the telephone via British Airways Executive Club. Flybe availability can also differ between avios.com and ba.com, although Flybe will not be available after 30th April 2019. Long-haul redemptions on Iberia have SUBSTANTIALLY lower taxes when booked at iberia.com. You will save at least £300 per person. I will discuss this in a stand-alone article on Iberia later in this series. Iberia Plus also has access to flights from Vueling, Royal Air Maroc, LEVEL, Iberia Express and others which you cannot book at ba.com. At least four economy and two business class seats will be available immediately on BA flights. There is no guarantee of World Traveller Plus or First Class seats being available at 355 days out. Further seats will usually open up at random in the months approaching departure, depending on sales of cash tickets. If you want a ‘high demand’ route such as Sydney or Cape Town in Club World and want to travel on a BA plane in order to use a British Airways American Express 2-4-1 voucher, you should be prepared to book the outbound flight as soon as it becomes available. This means at midnight (1am BST) via an open BA call centre (US, Japan) 355 days before departure – it will also drop onto the website at midnight but a telephone agent will have reserved the seats before you can make payment online. When the return becomes available a few days later, you need to call BA and have it added to your existing outbound ticket. Avios redemption tickets can be changed or cancelled for a £35 per ticket fee, deducted from the refund of your taxes. All cash and Avios are returned, the Avios usually come back instantly. This article explains the Avios cancellation rules and fees. You can change the return even after you have flown the outbound, subject to Avios seats being available. You cannot cancel a return flight once you have flown the outbound. You can fly into one airport and out of another without penalty as long as you follow the rules in this article. These redemptions can only be booked over the telephone, unless you book them as two one-way redemptions. It is OK to mix airlines when booking a redemption – you can fly British Airways to Doha and then Qatar Airways on to Mumbai, for example, on the same ticket. The ba.com website often struggles to offer all possible options when looking for redemptions to North America which involve a connection in the US. A good tip is to search via the American Airlines website at aa.com – you don’t need an account with them. Any reward seats which show as ‘sAAver’ flights on aa.com can be booked using Avios points – if you cannot get ba.com to bring up the flights then you need to call BA. Want to learn more about how to maximise your Avios redemptions? Keep an eye out for further updated articles in this series over the next few weeks. Ot – No bits – Going Dubai in a couple of weeks for my OH’s b’day for 5 nights, taking our 6 month old too. Wondering what people thought of RC Al Wadi vs Al Hamra? Not too bothered about activities as busy with the little one and only Gold Status in Bonvoy. Little one is learning to swim, so a private pool will be cool both both have them? Anyone know if they are heated? Both have pool. However I’m not sure what the standard Al Wadi villas are like because we got upgraded to one of the bigger tents. The Al Hamra pools are smaller than the Al Wadi tent pools but I can’t compare to the entry level accommodation. Al Hamra has the other benefit of being very near the mall for baby stuff. You might want to look at the Waldorf Astoria in Ras too. It is very cheap compared to Dubai prices, is almost next door to Al Hamra and because it is far bigger it might work a bit better. 5 nights at Al Hamra might also be too much unless you really are happy to sit by yourselves in your beachside villa. We went to the Waldorf at half term thanks to Rob’s tip. Was very impressed with it. Rooms are huge, family pool is excellent. Tons of room on the beach though it is rather artificial. It has a very good new food option now with the Siddharta lounge by Buddha Bar. Thanks, great article as always – I have been waiting for this one. One thing that concerned me was that it states that only 2 Business Class tickets may be made available. I am hoping that the “at least” is the important bit. Background is that I’m hoping that the family (3 of us) can all go outbound (from Heathrow) to San Franscisco and then return from LA to Heathrow. (August 2020) Does anyone have experience of this sort of trip – is it likely that I’d be able to get 3 Club World tickets? (with AMEX 2-4-1 voucher)? I was wondering if I missed an article that detailed how many reward seats get “generally” made available for each route (on the same plane) as I think that would be very useful for a lot of people. Thanks again – love this site! Think about flying to SJC instead of SFO. We are going First on a 241 to SFO in the summer because the availability was much easier than SFO, but not sure about Business on either one. Not sure about return from LAX as we are returning from IAD, but all the hints and tips on the site about how to secure the seats when they are released at midnight will help you. Book the outbound when they become available and then add the return later when they are released. It would be worth calling them up as I booked 3 seats using the avois 2-4-1 voucher to Texas (this was for 1 adult and 2 children) even though it only showed two reward flights available. As long as you have enough avois points to cover the extra full flight you can book another seat for a child as the operator told me this is possible as children can’t travel on their own. Not sure if this would be the case with two adults and 1 child though as could use voucher for 1 adult and 1 child and then pay for the additional adult but definitely worth a phone call. Thank you both – great information – really appreciate you taking the time to post. Rob – if you have time it’s well worth taking 5 minutes to check the Reward Flight Finder website each morning to build up a picture of how many seats generally get released to a particular destination (bearing in mind they have sometimes gone by the morning!). 2 CW is the minimum but it also depends on how likely BA are to sell seats in the cabin, so numbers of award seats may rise at low season, especially outside the school holidays. Saw a comment on an HFP post suggesting that a one-way flight from Brazil or HKG won’t incur fuel surcharges. Is there a list anywhere of locations with low/no surcharges? Presumably it makes those locations more attractive for 2 one-way tickets (unless using companion voucher)? I think HKG has stopped in principle, but it depends on whether the airline you are flying with actually imposes the surcharge as the change was recent. No point in a list as it would be rather short. Quick Q regarding lounge access BA if sliver member. Will you be granted access if on a hand baggage only flight? So I’ll be away for about 15 days. Straight back into the office, yes. I’m getting the red-eye from LAX. I’ve got it down to a fine art. Fast-track through security, à la carte supper in the Qantas lounge (those miles I racked up negotiating the Sydney JV in 2016 finally paid off), tackle the vital emails, then straight on to BA280. Turn left at the end of the jetway, wheels up 17:00. Eye mask on, earplugs in. I usually wake up just in time for a light snack and a cup of Earl Grey somewhere over Cork before touchdown at LHR. Actually, jet lag has never bothered me. I am blessed with the perfect metabolism and mindset for frequent flying. Mind you, I stick to a strict routine. Last time I went through Dubai they had relocated the snacks in the first class lounge at DXB and finding them cost me vital minutes. I had to break into a trot to make the gate. And it troubles me that Emirates is taking so long to phase out the 2-3-2 seat configuration on its 777s. Extraordinary what they think they can get away with. Hold bag? No way. That is what I call a cattle-class error. I don’t think I’ve checked luggage in since 1998 when Sabena lost my Samsonite Oyster inbound from Abidjan to Zaventem. Mind you, if you spend the whole flight engorging Hollywood blockbusters and cheap wine in the back of a 747, I guess even waiting for your case at baggage claim seems entertaining. This nifty titanium four-wheeler does the trick for me. Of course you don’t get much change out of £1,000 for a Rimowa Topas but you can get two weeks’ wardrobe in if you pack carefully and pare down the bulk by wearing boxers and socks for two days straight. After all, who’s going to notice? Anyway, must go: my UberExec’s waiting. I’ll be on a conference call while en route to Heathrow, so could you text the wife my flight plan as usual? Not that Sean reminds me of anybody! Hmm, from what I can glean, the £1000 titanium Rimowa Topas is checked luggage size, not cabin size! Online the flights are not reserved for you until you hit ‘pay now’. This takes 3-4 minutes. On the phone the agent puts a hold on the seats as soon as they pull them up, which will be quicker than you can do it online. Are you sure? I thought as soon as you have them in your basket online they’re yours? I had this conversation a couple of weeks ago with a BA rep.
No, because I tried it last week as an experiment with some SZG tickets for next Feb half term. Had 4Y in the basket but when I got to the end of the process I was told they were no longer available. Seats showed exactly at midnight. If putting them in your basket secured them no-one would need to call. Interesting. Online method has worked ok so far at t-355 (though I have all particulars set up and can check out v quickly), last month booking CPT too. No longer matters but you may need to call if not booked online. I have a 241 BA voucher about to expire. What are my options to get value out of it? I timed my 10k spend wrong unfortunately and cannot see a way of using it. I mean … that’s it really. Not much more to say! Even if that ends up being 2 x economy tickets to Amsterdam you’ve still saved 9,000 Avios. Thank you for this post. I was given an Avios card with my fuel points card and haven’t known how to redeem points. I’m not a frequent flyer, but planning a trip to Victoria Falls from Edinburgh later this year. It will be useful. on getting tickets to Aus – yesterday, whilst using the redemption checker, there was 2 seats in first, for each Tuesday and Wednesday of Feb 2020. Couldn’t believe it. Is there any idea why that might have been? Is there a day when they’re more likely to come up? I realise it’s 355 days before departure, but I’ve been watching a number of places for Feb 2020, and nothing at all for KL, Seychelles or Caribbean and i havent seen one come up in business or first since the turn of the year. Then suddenly 8 to Aus…. all gone now, mind.